Near to the hearts and homes of generations of Colorado skiers and riders, Loveland is Colorado’s true winter wonderland. Just 53 miles west of Denver, Loveland boasts 1,800 acres of remarkable terrain, FREE snowcat skiing, an innovative lesson program and more snow then any Front Range or Summit County resort. Loveland is home for those that simply want to ski or ride. Welcome home. Great Deal > Enjoy free snowcat rides to some of Loveland’s most exhilarating terrain on Loveland’s Ridge Cat. Take in the amazing 360 degree views as you are whisked along the North side of The Ridge in the comfort of our 20 passenger snowcat. Visit skiloveland.com for all the details. Loveland’s Ridge Cat is your free ride to fresh powder! Mountain Dining > Loveland Ski Area offers a variety of affordable and delicious dining options at Loveland Basin and Loveland Valley. Enjoy our made-to-order pizzas and sandwiches or try our tasty homemade soups and chili and look out for weekend BBQs on the Basin Patio in the spring. Stop by The Ptarmigan Roost Café at the top of the new Ptarmigan Lift and enjoy lunch on the spacious deck or cozy up next to the wood burning stove and warm up with a drink. Lessons > The Loveland Ski & Ride School offers ski, snowboard and telemark lesson packages for all ages and abilities. Loveland’s expert instructors can help you improve your skills with an affordable private or group lesson. The 3-Class Pass Program rewards all children and newcomer adults with a FREE season pass after three lessons! The Polar Explorers is a multi-week program for intermediate skiers 7-14. The Loveland Ski & Ride School offers ski lessons to children ages 4 and up and snowboard lessons to children 6 and up. Reservations required for ages 4-5. Contact the Loveland Ski & Ride School at 303.571.5580. Daycare > A fully-licensed facility accepting children 24 months to 12 years. Reservations recommended. Call 303.571.5580 for details. 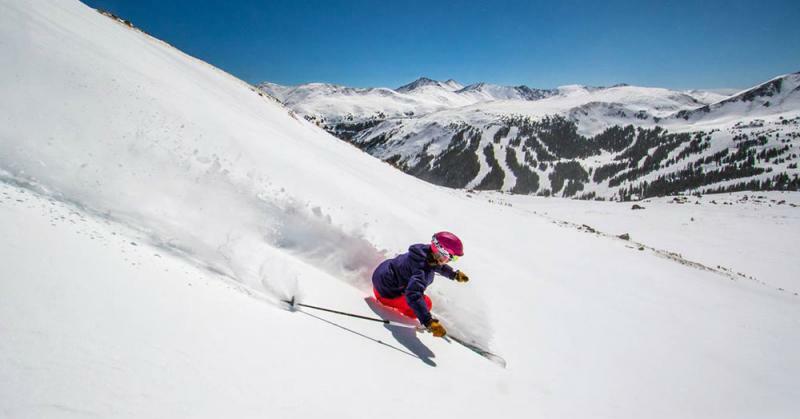 FYI > Loveland receives an average of 422” of snow every year and offers one of the longest seasons in the country – and Loveland is bigger than you think. We hide the good stuff in the back where you can find powder stashes days after a storm. We also have a variety of terrain for every level of skier and snowboarder. Chair 9 carries skiers and riders to an elevation of 12,700 feet high atop The Continental Divide where 360 degree views, open bowls and FREE snowcat skiing await. Extreme not your scene? Loveland is also well known for its perfectly groomed blue cruisers and its separated beginner area – Loveland Valley. Biggest Event > 26th Annual Marry Me & Ski for Free: This Loveland tradition is held each Valentine’s Day at the top of Ptarmigan Lift. It is a mass wedding ceremony where new couples are joined in matrimony and married couples renew their vows high atop the Continental Divide. Participating couples receive 2-for-1 lift tickets the day of the event. Après Spot > The Rathskeller Bar at Loveland Basin offers spring concerts, Taco Tuesdays and regular après parties. Georgetown and Idaho Springs also offer great bars, restaurants and activities on your way back to Denver. Visit the Clear Creek County Tourism Bureau online at www.clearcreekcounty.org to find all your great après options! Alternate Day > Enjoy a day off the slopes in the authentic mountain community of Georgetown, just 12 miles east of Loveland. Georgetown has been luring visitors since the 1850s with its beautiful scenery, rich history and warm hospitality. Or head west to Summit County and shop the Outlets at Silverthorne, just 12 miles west of the ski area. Directions by Car > 53 miles west of Denver via I-70 at Exit 216; 12 miles east of Summit County. Directions by Air > Denver International Airport offers non-stop service to and from most major U.S. cities and many international destinations.